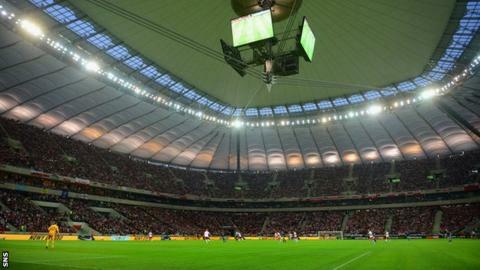 Scotland will play Poland in a friendly on 5 March as part of preparations for the Euro 2016 qualifiers. Gordon Strachan's side will travel to Warsaw looking to build on their victory in Norway and the 0-0 draw against the USA at Hampden last month. Poland have not qualified for next summer's World Cup in Brazil. The last encounter with the Poles was a 1-1 draw in the WKS Zawisza Stadium, Bydgoszcz, in 2001 with Scott Booth scoring from the penalty spot. Strachan said the match presents an opportunity for players to stake a claim for consideration ahead of the start of the Euro 2016 qualifiers. The 2016 competition in France has been expanded to 24 teams and the draw will be held in Nice on 23 February. "We can all be encouraged by the strong finish to 2013 and the challenge now for us is to continue that momentum into next year," said Strachan. "Poland will be a tough match, particularly in Warsaw, but it's exactly the type of contest we will need to overcome in the Euro Championship qualifiers. "Between now and March, we will monitor the performances of our core squad members but also those who have performed really well in recent months and who have come to our attention. "We are aware of their capabilities and we know there is a lot of excitement around some younger players who have emerged this season. "If they continue to develop and demonstrate that form consistently then there will be opportunities throughout our preparations for the start of the Euro Championship qualifiers."